The Kate Spade Scallop was a beautiful smartwatch, but it lacked a lot of the key features many want from smart wristwear so we have high hopes for the sequel just announced at CES 2019. 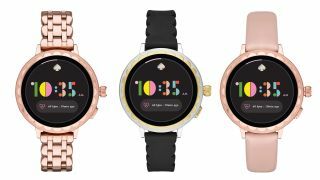 Parent company Fossil just announced the Kate Spade New York Scallop 2 smartwatch has lots internal improvements over the last generation including GPS so you can keep track of your location and NFC to allow for Google Pay contactless payments. The watch will also come running the latest version of Wear OS, so you'll have a much more intuitive experience at navigation around the watch's features and easy access to Google Assistant. There's a heart rate sensor on the watch, although the stainless steel design of the watch may mean you don't want to use this for exercise. That said, you can take the watch swimming as it has a 3ATM water resistance rating. The watch is available in a 42mm case with a crown on the right hand side to cycle through menus and a button below it that opens up the customizable Kate Spade specific watch face. It opens an app called "choose your look" that asks for a details about your current outfit and tries to make a customized face that'll be suitable for your watch that day. When it comes to straps, you'll be able to use your own 16mm as well as the leather and metal options on offer. Fossil estimates the battery life will be around a one to two days. Given our experience with similar watches made by Fossil, we think that'll be an accurate estimate. The company hasn't unveiled exactly what tech is inside powering the Scallop 2, but we've asked for some more details and will update this article when we hear back. We do know there's 4GB of storage for Wear OS apps and other media. In terms of pricing, you'll be spending $295 (about £230, AU$410) on the leather strap version of the watch while the metal strap variant starts at $335 (about £260, AU$470). We expect to hear more about the release date for the Kate Spade Scallop 2 in the coming weeks, but right now there's no clear schedule.